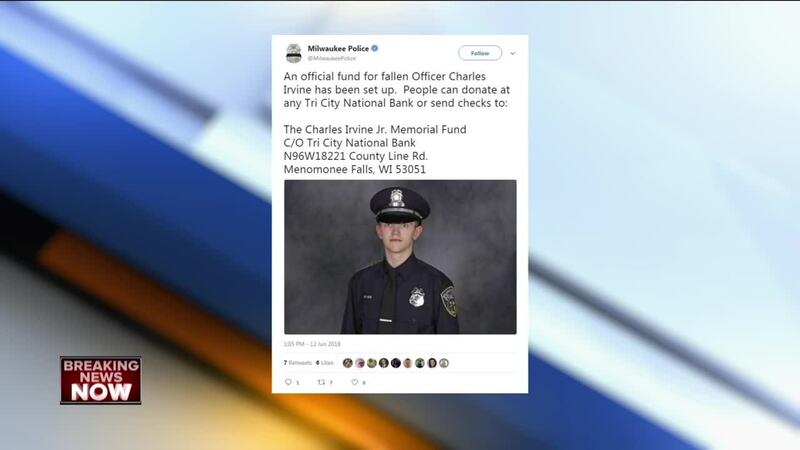 An official fund has been established for fallen MPD officer Charles Irvine Jr., the department announced Tuesday. MILWAUKEE -- The man accused of leading police on a chase that led to the death of Milwaukee police officer Charles Irvine Jr. pleaded guilty as part of a deal with the state Thursday. Ladell William Harrison changed his plea on six different counts to "guilty" as part of the deal. Those charges include manufacturing and delivering narcotics and charges related to the crash that killed Irvine Jr. Six other charges were dropped altogether. Sentencing has been scheduled for April 4, 2019 at 1:30 p.m.
Harrison was known to police as a suspected drug dealer and was out on bond from a previous offense at the time of the fatal crash , a criminal complaint shows. He was originally charged with 12 separate counts, including manufacture/delivery of a controlled substance, delivery of Schedule I or II narcotics, fleeing/eluding an officer resulting in death, bail jumping, and knowingly operating a motor vehicle while revoked. Police had been investigating Harrison at least since late 2017, when he was connected to a fentanyl overdose death in Waukesha County. Undercover officers staged drug buys with the suspect on multiple occasions. On the day of Irvine's death , Harrison was driving eastbound on W. Silver Spring in front of the officer's squad car. According to the complaint, Officers Irvine and Matthew Schulze ran Harrison's license plate, and attempted to perform a traffic stop when the light they were at turned green. Harrison sped off at that point, driving as fast as 96 miles per hour. He later told investigators he was afraid of getting pulled over because he had a gun in the car and was driving on a revoked license, the criminal complaint says. Harrison was arrested by officers later in the day after fleeing yet again when undercover officers attempted to arrest him. According to the complaint, the suspect had been released on bond for a previous operating while revoked offense at the time of the crash.